The GPU specialist's stock is likely not as "pricey" as it might initially seem. 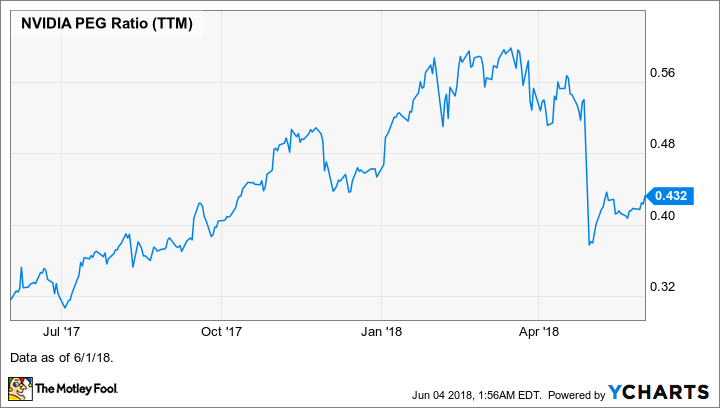 NVIDIA (NASDAQ:NVDA) stock has returned an amazing 1,090% in the three-year period through June 1, demolishing the S&P 500's 38.2% return. This naturally leaves many investors wondering, "Is it too late to buy NVIDIA stock?" My opinion is no, it's not. The graphics processing unit (GPU) specialist is benefiting from several enormous trends that are in the early stages, including esports and artificial intelligence (AI), and is also poised to majorly profit when driverless vehicles become legal across the land. But what about the sizable pack of bears who like to drum (or growl, as bears are wont to do) away that NVIDIA stock is "overvalued" or "overpriced"? Just as there are a fair number of species of bears in the world today (eight to be exact), there are a good number of varieties of the bear thesis that NVIDIA stock is overpriced. Here are the major issues with the bear thesis that NVIDIA stock is overvalued. These commonly used metrics look at valuation in a vacuum. Metrics that take earnings growth into account are much more useful. One such metric is the PEG, which is a stock's P/E divided by its earnings growth over the trailing 12 months. Many factors come into play, but a general rule of thumb that's applicable to many industries is that a PEG of 1.0 implies that a stock is about fairly valued. While we can't be sure what the future will hold, NVIDIA stock's PEG of 0.43 is encouraging and suggests the stock will prove to be attractively valued at the current price. The forward P/E is calculated using the consensus among Wall Street analysts for a company's EPS for the year ahead, while the forward PEG also uses the consensus projection for a company's year-over-year earnings growth. There's a big problem with the bears using any metric that's calculated using the Street's projections to support their view that NVIDIA stock is overpriced: Wall Street has a terrible record in estimating NVIDIA's earnings! On average, Wall Street underestimated NVIDIA's EPS over the past year by 39.9%! There's no recent improvement in the estimates either, which suggests to me it's very likely NVIDIA is going to continue to sail by the Street's estimates, at least for some time. If this turns out to be true, then NVIDIA stock will prove to be not as pricey as it might currently appear based on valuation metrics that use Wall Street's earnings projections.